Adolph Stieler - The Goat King. Stieler Hill is the high point on the road between Fredericksburg and Comfort. 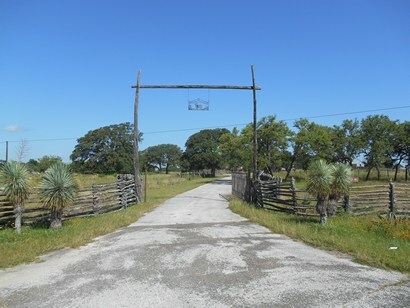 At the very top is the headquarters of the Stieler Ranch, once home to Adolph Stieler, the Goat King. 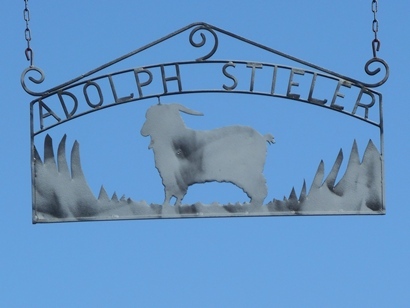 Adolph Steiler was born into the ranching business, with the blood of three famous ranch families flowing in his veins. His grandfather on his mother's side was Caspar Real who came to Kerr County in the 1850s. Real married Emelie Schreiner, one of Captain Charles Schreiner's sisters. Caspar Real imported Delaine sheep from Ohio. He shipped them down the Mississippi River by riverboat to New Orleans, by steam ship to Indianola, and then by wagon to his ranch in Kerr County. Hermann Stieler, Adolph's father, was born in Germany but came to Kerr County to work as a freighter for Captain Schreiner. On January 1, 1877, Hermann married Emma Real, Caspar and Emelie's daughter. 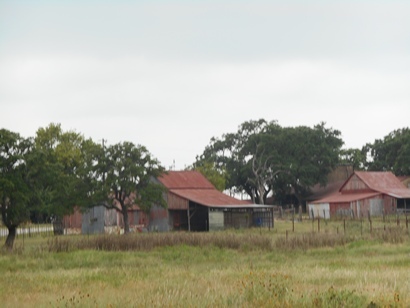 In the 1870s, Hermann took up three sections of land in the Hill Country near Comfort. He retired in 1917 and turned his sheep ranch, now covering 25 sections, over to his sons. In 1921 Adolph Stieler borrowed money against a life insurance policy to buy 800 angora goats. His neighbors thought he was crazy. At the time goats sold for 25 to 50 cents apiece. Mohair sold for 6 cents a pound. No one made money in the goat business. But Adolph saw the big picture and had an uncanny feel for the flow of the nation's economy. He saw that automobile manufacturers were beginning to make upholstery out of mohair. Clothing manufacturers were using more mohair for suits, coats, dresses, and sweaters. Prices began to rise. 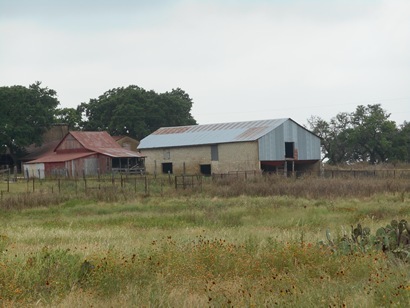 Adolph Stieler held the course, and by 1942 he owned 38,000 goats, 20,000 sheep, and 1,000 cattle grazing on 90,000 acres in Kendall, Kimble, Kerr, Gillespie, Blanco, and San Saba Counties. Adolph was a skilled stockman who knew how to manage the range. He studied the grazing patterns of goats, sheep, cattle, and deer, and he used his knowledge to get the most out of each pasture without overgrazing it. In 1942, as war raged in Europe and the Pacific, Life Magazine sent renowned photographer Alfred Eisenstaedt to Stieler Hill to visit the Goat King. That was three years before Eisenstaedt took his most famous picture - the kissing sailor in Times Square on V. J. Day. Life Magazine introduced the Goat King and his subjects to the world. "Goats are among man's oldest friends," Life told its readers. "Goats are mentioned 137 times in the Bible." "Angoras are the blue-blooded elite of the goat world. Their long, curly, silky fleece, known commercially as mohair, is used to make fine upholstery, yarn, and fabrics." "Angora goats are dainty, shy, and not at all smelly. Their fleece is so rich in healthy oil (lanolin), that goat men who handle them a lot have pink soft hands like a baby's." When the American economy took off after the war, the price of mohair soared. By 1950, mohair was selling at 85cents a pound. Angoras sold for $15 to $16 apiece. Adolph Stieler was a wealthy man. Adolph's first wife died in 1936. In 1955, he married Merle Porter of Austin. Their reception was in the Crystal Ballroom at the Driskill Hotel. They honeymooned in New Orleans, Miami, and Havana. Adolph Stieler was a dyed-in-the-wool Republican. On January 20, 1952 he traveled to Washington, D. C. to attend the inauguration of his friend Dwight Eisenhower, and he was a delegate to the 1956 Republican Convention. In 1956 Mrs. Stieler made a gift for Mamie Eisenhower - a lime green felt skirt adorned with felt elephants and the words "There's nothing wrong in Texas that Ike and a little rain won't cure." On August 9, 1969 local Republicans honored Mr. and Mrs. Stieler with a reception at Louise Hayes Park in Kerrville. The main speaker was another Stieler friend, Congressman George H. W. Bush from Houston. At the end of the speech George Bush and Adolph Stieler stood together on the podium - the future President of the United States and the Goat King of Stieler Hill. 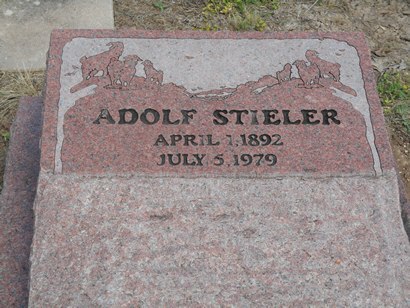 Adolph Stieler's grave in Comfort Cemetery. Kerrville Mountain Sun, August 3, 1944, "Golden Fleece," p7. Life Magazine, August 31, 1942. Albuquerque Journal August 24, 1956, "Mrs. Eisenhower Chooses Purple," p17, c2. East St. Louis Daily Livestock Reporter, May 23, 1957, p3, c1. Fredericksburg Standard, August 13, 1969, "Republicans Honor Stielers at Barbecue," p3, c4.